A new version 10.8 of our encryption software USBCrypt is available now! We’ve just released a new beta version 0.9.2 of USBCrypt. It incorporates quite a few of the suggestions and bug fixes discovered during the previous beta. Keep them coming! Download the new beta and give it a try. The first public beta version 0.9.1 of USBCrypt is available now! You can try the pre-release (beta) version to see how well it works for you. If you encounter a problem, please report it directly to the USBCrypt development team, to give it a chance to correct the error before officially releasing USBCrypt. In return, as our “thank you”, we are offering a free license to anyone who gives useful* feedback during the beta testing. Of course, before you decide to try the beta version, consider carefully that it has not been fully tested yet and contains some unfinished pieces of code that may result in various problems (including the system crashes and data loss!). We DO NOT recommend trying the beta version on your main computer. Instead, we’d highly recommend installing it on a spare computer, that has no important files of yours. Only after giving it a good test, if you are confident in the beta version and your troubleshooting skills, you may want to try it on your main computer. In any case, it’s always a good idea to do the regular backup of your hard disk, to avoid losing your files should an unanticipated problem occur. Want to give it a try? 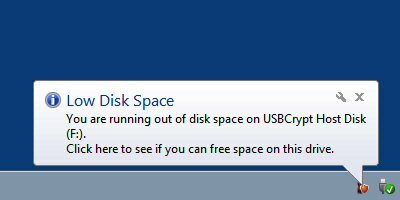 Go to the USBCrypt beta page to to find the download link and other related information. Note: Due to the US government export restrictions, we can distribute USBCrypt software to the US residents only at this time. We anticipate to open the beta test to other users at a later date, after we have received the necessary export clearance from the US government. *We reserve the right to decide which feedback is useful and which is not. For example, the general statements like “The application runs well” or “The application does not run” will not be considered useful. To be “useful”, we need much more detailed information about the problem you are experiencing, including the specifics of your computer, the version and edition of Windows that you run, the list of steps that we could execute to reproduce the error, and other relevant information that may help us correct the error.